Taken by Constanza von Marees during the 2015 PDC. 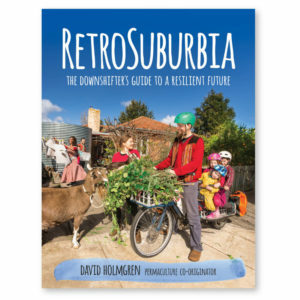 You will learn from the very original cofounder of permaculture, David Holmgren, and a team of world class permaculture practitioners and educators. Their depth of practical and theoretical knowledge will make this very special standout PDC. There will be ample opportunity to socialise with the presenters outside the session times. This is the course designed specifically to the twelve principles David details in Permaculture: principles and pathways beyond sustainability. We will focus on one principle a day, and by the end of the course, you will be equipped with the foundations of permaculture philosophy, design and knowledge. You will receive a certificate at the end of the course which makes you eligible to practice or teach permaculture commercially and to proceed towards the Diploma in Permaculture Design. The course will take place in the Wombat Forest south of Daylesford at the beautiful Rocklyn Yoga Ashram. This remote setting away from towns, traffic and the temptations of noise and junk food, will be ideal for learning permaculture. 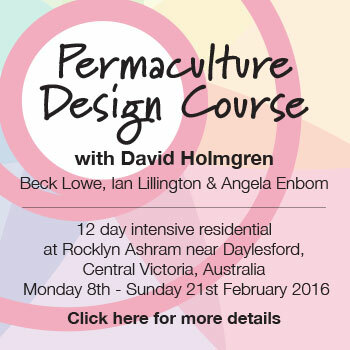 You will see many working examples of permaculture during the course. The Ashram’s extensive garden, designed and completed by David and Hamish MacCallum, will feed you during the course. 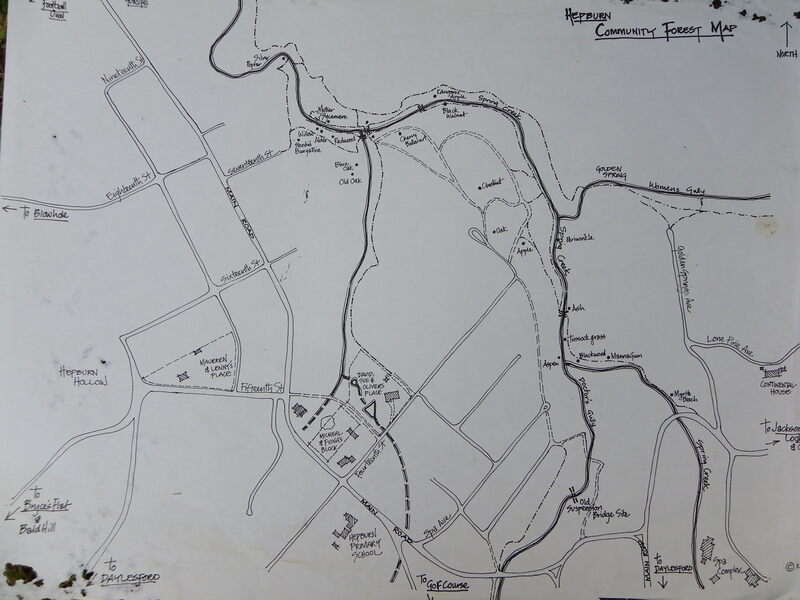 You will also see permaculture design applications in both urbane and rural settings in the local area including one of the best permaculture demonstration sites in the world, Melliodora. The serene and spiritual focus of the Ashram complements the mindfulness of permaculture practice and reminds us to balance our activity and thinking with reflection, a point not normally emphasised in PDCs. You are encouraged to take part in the Ashram’s daily yoga programs. Delicious wholesome and nutritious meals will be prepared by Su Dennett with the Ashram’s catering crew. Most of the food for the course will come from the Ashram’s extensive permaculture gardens. With plenty of love and care, Su will make sure that what you eat will be delicious, and at the same time, meet permaculture standards. 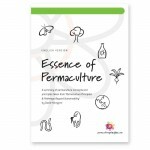 During the course, in other words, you will live a “permaculture life”. Within close proximity to Melbourne, Castlemaine and Ballarat, the Ashram is centrally located, though the overwhelming feeling when you’re there is of being in a very special relaxing environment, another world. You will work on a design project of your choice during the course, guided by experienced tutors, you will experience the fundamentals of permaculture to design the world you want. The list can go on, but the available places are limited to ensure the quality. Take a positive step, and be early. An enormous event is coming up next weekend. The Local Lives, Global Matters conference is gearing up to a great conference with the range of local and international speakers. Over three days, at Castlemaine, the conference examines and discusses the way to get happier. The solution seems local. Communities all around the world are already doing it. The conference is planning to builds on what is already happening by fostering thriving, local and regional economies and societies, and accelerating the transition to a world without fossil fuels and growth addictions. It is not your usual ‘conference’ though, the program is full of plenaries, workshops, story-telling, arts and music, as well as site visits showcasing local initiatives. Themes include meaningful livelihoods, reducing scale, reclaiming democracy, local interdependence and the strengthening of spiritual values. Speakers to appear include David Holmgren (one of the keynote speakers at the town hall on the first day), Helena Norberg-Hodge, Manish Jain (India), Camila Moreno (Brazil), Rob Hopkins (UK), Raphael Souchier (France), Samuel Alexander, Susan Murphy, Dave Rastovich and Lauren Hill Australia). In fact, David will be there over three days. On Friday David will deliver a keynote speech (3.40pm) at the town hall. On Sat, he will take part in a panel discussion in Manish Jain’s plenary session on “Social and ecological justice” (10am) along with Camilla Moreno who will then give a session on “Reclaiming democracy”. Then on Sunday, he will be a part of the panel with Ellen Madigan, Latarnie McDonald, Michelle and Chris McColl, Rob Kirby, and Helena Norberg-Hodge to disucss the problem of the centralised food supply system. For his final appearance, on Sunday at the town hall David will be a part of the closing plenary session with Jacques Boulet and Norberg Hodge to sum up the weekend. It is a choc a block weekend already, but there is another good one on Saturday afternoon, pop over to the Buckley room at St Mary’s Church at 4.15pm. Su Dennett and Maureen Corbett from Hepburn Relocalisation Network will give a workshop called “Paradise Lost, Paradise Regained” to follow up Urban Food Collective/Kym Blechynden (Feed the Future). 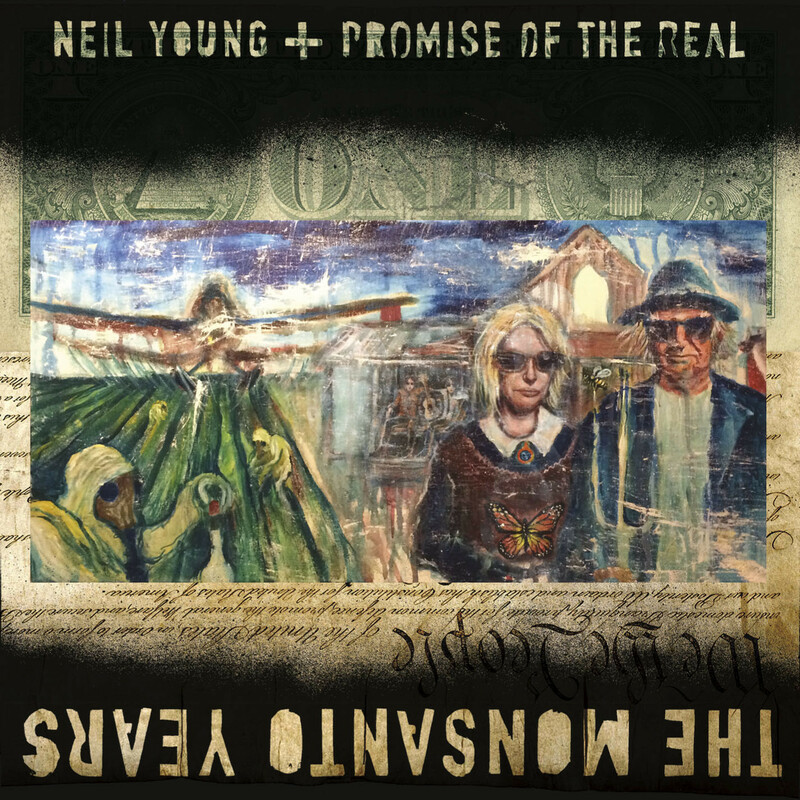 So belts out the veteran singer songwriter Neil Young with Promise of the Real on their title track from his latest album, The Monsanto years. What is the old protest rocker raging about? Monsanto and the war on weeds. What are the weeds? 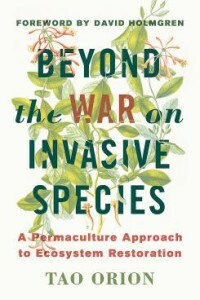 According to the National Invasive Species Council of the USA weeds are “an alien species whose introduction does or is likely to cause economic or environmental harm or harm to human health.” Spearheaded by good intentioned nativists, the war is declared all over the world, on weeds. But are we as qualified as mother nature or god to decide what plants should grow, while others are declared noxious and exterminated? Intriguing stuff. All these questions were recently discussed on Australia’s ABC radio’s Late Night Live program. Taking part in discussion was Andrew Cockburn and David Holmgren. Environmentalists used to fight against chain saws, bulldozers and poisons. Now they’re fighting ‘invasive’ species of plants and animals – with the help of chain saws, bulldozers and poisons. Who benefits? Mainly the company that was once their sworn enemy – Monsanto. You can hear the program on ABC‘s website. Cockburn’s poignant piece on Harper’s magazine. 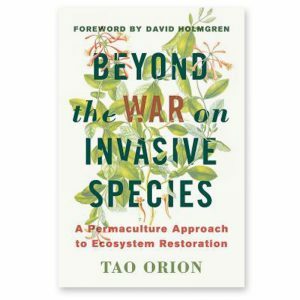 Holmgren’s articles and other writings on weeds are found here, especially recommended for reading are foreword to Beyond the WAR on invasive species by Tao Orion and Weeds or wild nature. Neil Young also has made a mini doco on the story of Michael White vs Monsanto, Seeding Fear. Birrith Birrith, a mature yet still evolving permaculture property in the permaculture neighbourhood of Hepburn has hosted two well attended open days and is hosting the third on November 8th. This property was developed principally by Maureen Corbett, one of the original Solar Sisters, and the pillar of the Holmgren Design office. Maureen’s property is now for sale. 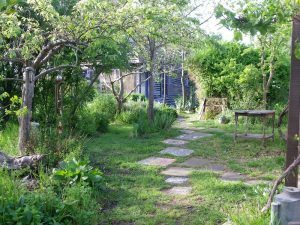 The local permaculture community hope that the property is taken up by like minded sustainability conscious permaculture enthusiasts. 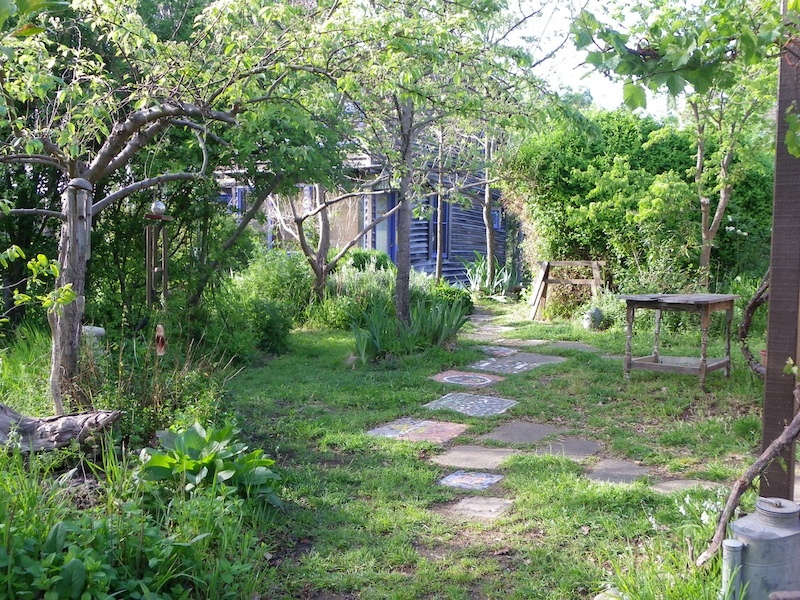 If you are looking for a mature permaculture property, look no further. Come around to explore the vision of sustainable, home-based, healthy, happy living. It will be a day to browse and think about a bright future, and discuss cooperative living arrangements with each other and Ian Lillington who has exceptional knowledge and experience in this area. The property will be open from 1.30pm to 4pm. We will tour the property with Ian and/or Maureen and at 3.00pm there will be an afternoon tea, during which you are encouraged to ask questions and discuss options for living in community. If you are keen to join an eco-village but don’t know others there is the opportunity to meet them on this day and get it happening straight away. No need to rush, relax in the garden and envisage a possible permaculture future. Please add this to any permaculture networks you are part of, to help get the word out. 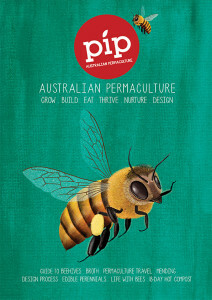 The brand new issue of Australia’s only printed Permaculture journal Pip magazine is out. Pip #4 is packed with articles on soil, perennials, the art of free travel, a permaculture diet, sharing permaculture with your children, earth bag building and more. Its feature is, as you may have already guessed, bees. Humble bees. What is their plight, and can we do something to save them? The best backyard beehives? What about native bees? You will bee informed! As its new regular special feature, the magazine comes with the most comprehensive and updated directory to permaculture and related courses happening all around the country, and a new real estate section for those looking for permaculture property. Our other favourite feature story in this issue is “Artist as family”. In this piece, Patrick Jones and Meg Ulman explain how twelve permaculture principles were applied while they went cycling with the family, all the way up the east coast to the top of the continent from their home in Daylesford. We are eagerly waiting to read their forthcoming book The art of free travel. Product of a dedicated team of enthusiasts, spearheaded by the publishing editor, Robyn Rosenfeldt, Pip magazine was launched early last year. This new magazine has found its niche in a crowded sustainability (from gardening, farming, owner-building, energy, architecture) magazine market. It stands out because it has permaculture principles firmly set in spine, while its fellow shelf dwellers only hover around blindly. Its articles are informative and practical, and they are attractively laid out and designed in print format. Itself, an embodiment and expression of permaculture. Design the world we want, is the theme of the 12th International Permaculture Conference due to take place in London on September 8 and 9. Among the luminaries of permaculture, David Holmgren, co-originator of the Permaculture concept, will deliver a 10 min message from 9.50am at the very start of the conference on Sept 8th, under the title of “Permaculture and Energy Descent” reflecting on the birth and growth of permaculture in a wide context. Waves of adoption and spread of permaculture over the last 40 years are strongly correlated with large scale geopolitical and economic cycles and events. 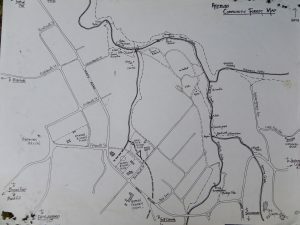 This history suggests the future form of permaculture will be shaped more by these forces than the desires or plans of individuals or organisations. If the inevitable transition to a renewable energy future follows the energy ascent trajectories of the fossil fuelled transitions of the last 250 years, permaculture is likely to remain an ethical or lifestyle choice of a minority in a conflicted but materially abundant world. If, on the other hand, the renewable future, is to one of energy descent as I have described, then permaculture, in principle, if not in name will become normalised adaptive human behaviour for rediscovering our place in nature. We all may have strong opinions, hopes, and fears about possible futures and how to shape them through permaculture, but the necessary transformation is as much an inner process, as it is external. Seeing energy descent as an opportunity rather than a problem might just be the largest and most significant contribution of permaculture thinking to a prosperous way down for humanity. His speech as well as the others will be streamed live, the details are here. Later on, during the convergence at Gilwell Park, Essex, David will conduct give an address via internet, “Controversial and Convoluted Issues of Permaculture Theory and Practice”. This is scheduled for Sept 11th from 10am to 11am, see the timetable. As the permaculture movement grows in size and strength it is important that robust debate and hard won experience informs the on going evolution of theory and the allocation of resources to strategies that work. A wide range of claims by permaculture activists and literature remain contested outside and within the movement. 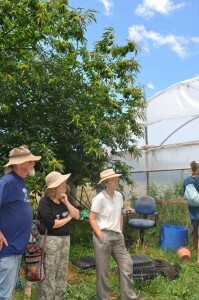 A series of issues generate heat and shape peoples attitudes about permaculture. Some examples include the productivity of forest gardens in the temperate zones, the utility of swales or keyline in diverse landscapes, the adverse impacts or benefits of naturalised plants, the role of spirituality in permaculture, the utility of top down vs bottom up change, the faith or skepticism about technological solutions to resource constraints, the limits to global carrying capacity, the utility or otherwise of green capitalism, the place of political activism in permaculture and even, the curriculum for PDCs. As a contribution to healthy debate and evolution of thinking within the movement, David Holmgren frames these debates in the context of energy descent futures, and for the majority of the time will give extended answers to questions about his take on issues raised by participants. An extended Q & A session with David will follow his address. While David will be making himself seen and heard via internet, our brother in arms, Charlie Mgee and his Formidable Vegetable Sound System, who have just released a new remix album Radish Beets, will be there in person. He will sing tunes on various occasions, and run a workshop on how to propagate the permaculture narrative, “Sing the change you want to see“. Too cold to go out in the garden? Winter is a good time to prepare and plan for the seasons to come. It’s future planning time. It is also a good time to watch a good film. Well, if that is your cup of tea and if you are in the Goulburn Valley area, and interested in creating healthier communities, livelihoods and fun founded on initiatives that are sustainable and support local producers then the second Tatura film festival is the one for you. It will be held on Saturday August 29. Organised by Transition Tatura, the 397th Transition town in the world according to the official register, the festival will focus on food. Where do you get your food from and how does it get to you? 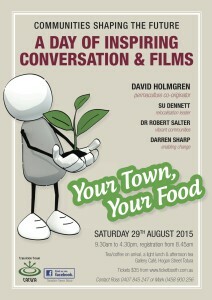 What’s so good about local food, looking at production, distribution, consumption and composting? What is the real cost of what we eat, and who dictates what one eats? You or a big supermarket , or agrobusiness corporation? These are just some of the topics that will be covered on the day. 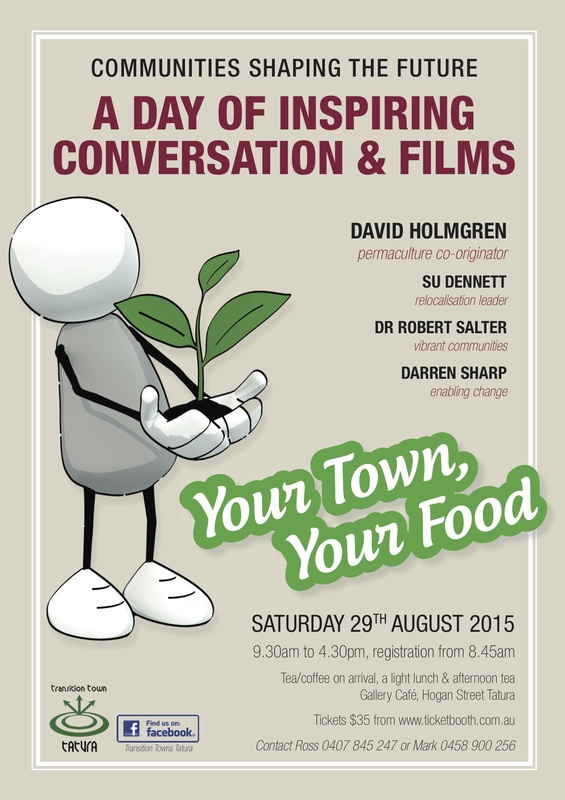 David Holmgren will be the keynote speaker and he will introduce the film Design for Life (Australia, 68mins) while Su Dennett from Hepburn Relocalisation Network will show a 2009 film from USA, Homegrown revolution. Following the films, they will discuss some of the points raised in the films, and take part in a community conversation on localisation, energy reduction and resilient community building. If you are in the area, why don’t you come around and spend a day watching thought provoking films, take part in the discussion, and join in planning for the future .